A 30-yard screamer from substitute Dion Charles rescued a point for the Coasters as they had to fight back to claim a 2-2 draw after taking the lead. It was Danny Rowe who broke the deadlock in the 40th minute for Fylde with a powerful effort. 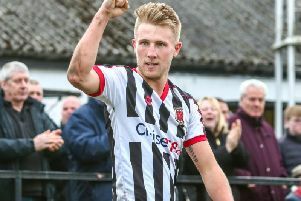 It was a lead they held on to until deep in the second half before two quick second half goals from James Dean and a Tom Hannigan own goal saw Chorley take the lead. However, Charles equalised with just two minutes of normal time remaining. It was a slow and steady start to the game, with Chorley mainly relying on set pieces and long balls into the box for their attacks and in truth the first half was quite quiet. Dean had the first attempt, but it ended up way over the bar from 35 yards in what was an extremely ambitious attempt. Matt Flynn then tried a header from just inside the six yard box but it was easy for Hinchliffe. Dean broke free and ran past the defence before unleashing a ferocious left footed strike towards goal, but it went just over the bar. It was the Coasters turn to have a say in the game, and Matt Flynn managed to clear the ball off the line for Chorley after Richie Allen cut in from the left hand side to fire at goal when it looked like it was in. Rowe opened the scoring as he fired past Sam Ashton iafter some good build up play down the left hand side from Matt Blinkhorn. The second half provided little and the game didn’t have that much to offer until the final 20 minutes. With 18 minutes to go, James Dean managed to find a yard of space in a crowded penalty area to fire the ball into the bottom left hand corner. And just three minutes later, Chorley took the lead in bizarre fashion. A good free-kick into the box took a number of touches before finding the back of the net, and it looked like Hannigan got the final touch. The Coasters had to find a way back into the game, and Danny Rowe hit a ferocious free-kick at goal from a good 30 yards out but it flew just over the bar. Then it was the turn of Richie Baker who controlled well outside the box before volleying the ball towards to top left hand corner, only for the superb Ashton to keep it out and send it over the bar. Then came a moment that Dion Charles will remember for a long time as he equalised superbly, cutting in from right to hit a sweet shot into the top corner from 30 yards out to bring the game all square. Charles had only been on the field for three minutes before scoring and it brought the Coasters level. Meanwhile, in the NPL First Division North, two goals from Stuart Vasey and one each for Daniel Mahoney and Curtis Thompson helped Bamber Bridge to an emphatic 4-1 victory over Prescot Cables.